Here is a collection of 12 antique & vintage NUT PICKS. Some nutpicks are silverplate & some unknown metal. Measurements: Nut Pick 4 3/4" in length (approximately). The ornate nut picks are antique and silverplate. The narrow straight nut picks are vintage 1950's and I believe that they are chrome plated perhaps on stainless steel. Condition: Overall, the nut picks are in good pre-used condition with some faults. 2 nut picks have some silverplate loss. These are the 2 nutpicks from the left side. There is silverplate loss on the handles for both of them. 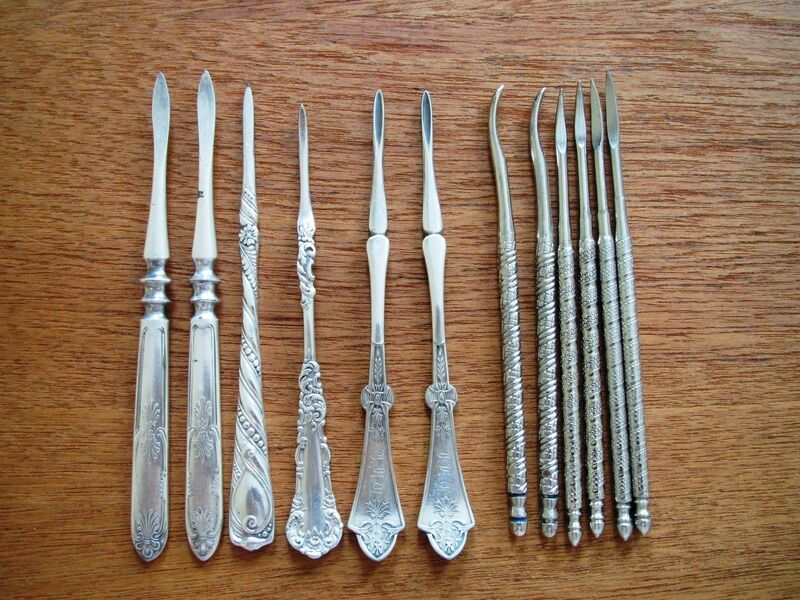 One has silverplate loss on the pick portion (see photos). Two of the nut picks have a monogram. Most have been polished but the appear would improve with additional cleaning.